Make it official. Boaz and the other relative have been discussing plans, but now it is time to make them official. Read Ruth 4:7-8. Now this was the custom in former times in Israel concerning the redemption and the exchange of land to confirm any matter: a man removed his sandal and gave it to another; and this was the manner of attestation in Israel. 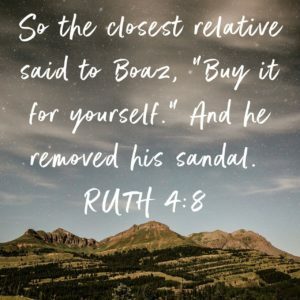 So the closest relative said to Boaz, “Buy it for yourself.” And he removed his sandal. There was a specified way of doing business and that needed to be followed. It wasn’t enough for the other relative to just say it was ok. They had to make the transaction official. Do we go the extra steps when something needs to be done? Or, do we do “just enough” to make things work and get by. Or, do we avoid making things official so we can always have a loophole to fall back on? When we commit ourselves to something, we need to be trustworthy and make sure our actions are in line with what we have committed to. And that means making things official and following through on our commitments. Will we follow through today?